to record highs and construction speak so it’s no surprise the prices are coming back now. Now this data from CoreLogic showed that prices fell by 4.8% over 2018 the declines were led by a 9% fall in Sydney and a 7% fall in Melbourne values dropped in half the nation’s capital city. the other half saw prices rise but mainly at a slower pace. Hobart Hobart prices jumped by eight point seven percent. Well joining me now to discuss the outlook for the Australian economy is head of global markets research at the Commonwealth Bank Stephen Hamrick. 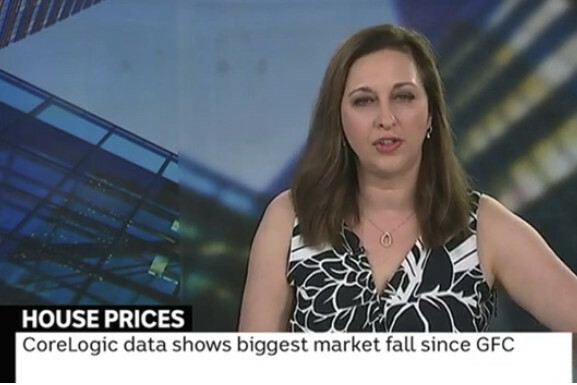 What’s your view on the Australian high housing market are you expecting further Falls, “well we are and there she just seems to that data we had some Falls at the very end of last year and, we would expect some further fall through 2019, perhaps around 10 to 15% for both Sydney and Melbourne. so it’s a little bit more to go but I think we need to put those declines in the context we’re talking about in that piece there you know the biggest fall since the GFC. well, in that ten-year period Sydney and Melbourne house prices will wrap you know quite massively you know 70 75 80 percent so some declines from those huge gains is is not surprising given the increase in supply and some reduction and demand that we’ve seen over the course of last year.